Laurent de Brunhoff, whose father, Jean, invented the Babar children's books, and his wife, Phyllis Rose, a 1964 graduate of Radcliffe, have donated the original Jean de Brunhoff work to Houghton Library. Babar, the beloved elephant of children’s literature known as much for his ability to overcome life’s challenges as for his snazzy, green three-piece suit and yellow crown, has returned to Harvard. The popular pachyderm arrived this week as the focus of a new exhibition at Houghton Library titled in similar fashion to the iconic picture books. 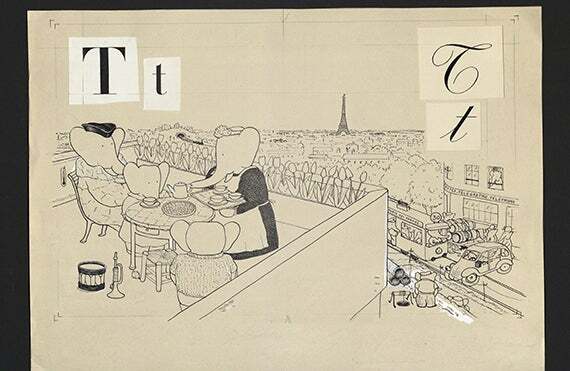 Called “Babar Comes to Houghton,” the display, which runs through Aug. 31, celebrates the donation of archival work of his creator, Jean de Brunhoff, the French writer and artist who brought him to life in 1931. Laurent, who is now 90 and lives in Key West, Fla., visited Houghton along with his wife, Phyllis Rose, a 1964 Radcliffe College graduate who earned her Ph.D. in English literature. Author of “Parallel Lives: Five Victorian Marriages,” among other books, Rose described her time at Harvard as blissful, and said she still has dreams about riding her bike from the Radcliffe Quad to Harvard Yard. 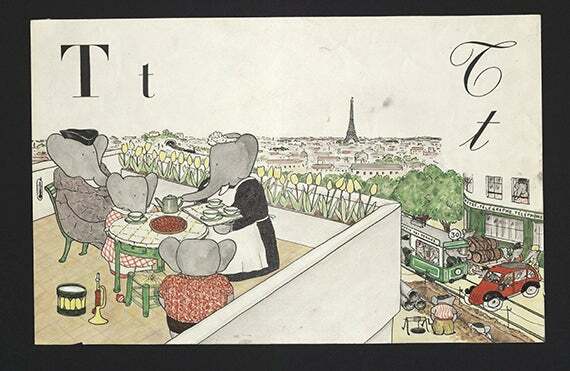 “It was like I found Celesteville,” said Rose, referring to the imaginary capital of Babar’s kingdom. This wasn’t de Brunhoff’s first trip to Harvard. In the mid-1960s, he visited on his first trip to the United States during a stopover arranged by his publisher at Random House, Robert Bernstein ’44. De Brunhoff put his adventures into watercolor on several pages of “Babar Comes to America” (1966) with highlights that included Babar’s taking in the Harvard-Yale game, getting an honorary degree, and relaxing at the Harvard Lampoon. More recent literary adventures have taken the elephant to the Olympics (“Babar’s Celesteville Games”) and the tropics (“Babar on Paradise Island”), but the Houghton exhibition features exclusively the creation of “ABC de Babar” (“Babar’s ABC”) from Jean’s early sketches to his masterful final hand-colored proofs. Though the library is still searching for a first French edition of the book, Mayo said the archival donation gives Houghton a rare look at the entire creative process, particularly the preparatory materials involved in the writing and design. Before de Brunhoff and his wife visited Houghton last week, he reflected on taking over his father’s work in 1946. “My mother was a widow with three boys, and life was very hard. When the war [World War II] was over and we had time to take stock of the situation, I missed my father. I had been trained as an artist, and just found myself drawing Babar. For me it was soothing and wonderful to be continuing what my father did,” he said. In honor of the show, the library commissioned an original watercolor from de Brunhoff through the Mary Ryan Gallery in New York City. It shows Babar, “ABC de Babar” in hand, walking into Houghton. Rose, who first met de Brunhoff while in Paris researching her book “Jazz Cleopatra,” a biography of Josephine Baker, said she collaborates with de Brunhoff, writing storylines to pair with his illustrations. Michael Puett, the Walter C. Klein Professor of Chinese History, and local author Christine Gross-Loh have co-authored "The Path," a book that brings the ideas of ancient Chinese philosophy to a modern-day audience.